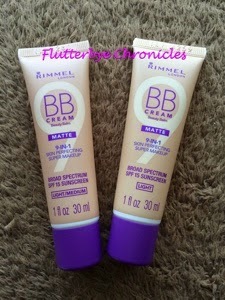 I saw these Rimmel 9 in 1 BB creams on sale yesterday at Walgreens. They are usually $6.99 but are on sale til the 14th for $3.49. 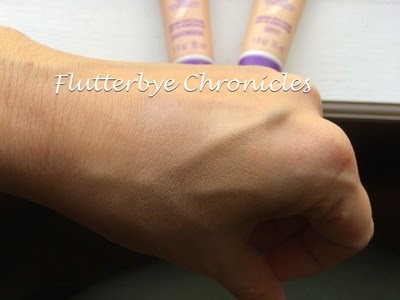 I googled it to see if I could find swatches but I could only find it for the original one that came out in 2013. 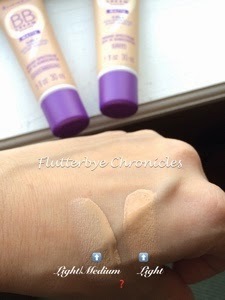 Seems they added the Matte and Radiance BB's to their line in 2014 and I could not find much on them. So I went ahead and grabbed the light and light/medium since I figured I may have to do some mixing of colors and I am glad I did. When I got home I put them on my hand and I was like What??? The light is way darker then the light/medium and has way more yellow in it. Weird right? But because I bought them both I just mixed the two together and voila perfect shade for me. I think the light might actually work great for me in the summer which I still think is sooo weird that the light is the dark one. Today I tested it out. I had to do a volunteer thing at my son's school and it was outside from 10:30 am -1 pm. It was very hot, humid and misty today so it was the perfect day to test it. 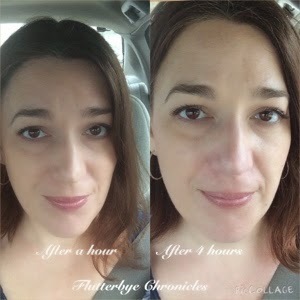 Both pictures were taken in my car with natural light and no filter was applied. You can definitely see some wear but I think it held up pretty well considering and I wasn't a big grease ball in my t-zone like I usually am. 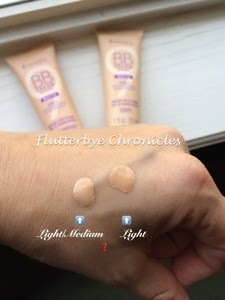 The BB is definitely a light coverage so if full coverage is what you go for on a day to day basis this is not for you. I like it because summer is coming and this is perfect for the hot/humid months here in FL especially since it has SPF 15. * Minimizes The Appearance Of Pores - I truly could not tell a difference but it did not accentuate them so that is a plus! * Evens Skin Tone - Yes I do believe it does this! 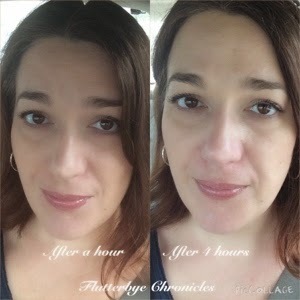 * Mattifies - Yes although I still think I needed a little powder touch up at 4+ hours but it was better then how my t-zone can look with other BB's or foundations. * Soothes- Yes. It felt very nice on the skin. * Conceals Dark Circles - Um sorta but not the best. For a one step though it was good enough for those days where you only want to wear one product. * Helps Prevent Blemishes - Verdict is still out on this one since I just started using it. * Gives All-Day Coverage - Does anything ever give all day coverage LOL!! It does okay, but I am not going as far to say all day. I liked it enough to buy some back ups for summer and since they are so cheap right now you might wanna run and get you some too.